In 1895, James Walker Tufts, the wealthy head of the American Soda Fountain Company, bought 600 acres of land as part of a plan to build a health resort in the secluded, rural area of Moore County known as the Sandhills. The area had been largely skipped over in the economic development of the state because of its isolation and lack of useful soil. Tufts built the Village of Pinehurst, modeled after the villages of his native New England, as a winter resort. In 1900, Tufts hired Donald Ross to design golf courses for the resort. Ever since, the Pinehurst area has been a mecca for golfers. By 2009, Moore County had 40 golf courses. For a long time, the community was closed to Jews and other minorities, but in recent decades, a growing number of Jews have moved to the area and set down roots among the golf courses and planned developments of Pinehurst. In the 1950s, a few Jewish families moved to Southern Pines, a small town east of Pinehurst Village. By the 1970s, Jewish retirees began to settle in the Pinehurst area. In 1981, they created the Sandhills Jewish Cultural Group, which sponsored various social and cultural events. Later, a handful of Jewish families moved to area, several of whom were doctors hired by the regional medical center. As Pinehurst grew as a tourist and retirement destination, a growing number of Jewish professionals and businesspeople moved to the area. Concerned about passing down their Judaism to their children, they established the Sandhills Jewish Organization in the 1990s, which held regular services and had a religious school. While Jewish youth education was the top priority for this new group, the retirees did not need the same services and initially had little interest in a formal congregation. Finally, in 1999, the two groups decided to unite and formally establish the Sandhills Jewish Congregation. Lowell Simon, a native New Yorker who had helped broker the merger, was elected president of the new congregation, a position he held for the next ten years. For their first High Holidays, members led the services. For the next few years, the congregation hired student rabbis and retired rabbis to lead services. In 2003, the congregation hired retired rabbi Floyd Herman to be their regular visiting spiritual leader. Rabbi Herman's tenure was followed by Rabbi Kenneth Brickman in 2011. Once a month and on the High Holidays, Rabbi Brickman travels to Pinehurst to lead services. The congregation received a Torah from the Jewish congregation in Whiteville, North Carolina, which was declining and did not need the extra scroll. 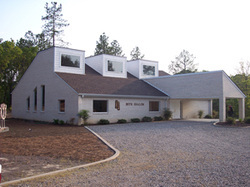 In 2001, the fledgling congregation decided to build a synagogue. After purchasing three acres in Foxfire Village, the congregation dedicated its new building in 2002. Although members come from diverse Jewish backgrounds, the congregation decided to affiliate with the Union for Reform Judaism. While most of the larger Pinehurst community had little experience with Jews, the Sandhills Jewish Congregation found a warm welcome from their Gentile neighbors. Several churches offered to loan their sanctuaries to the new congregation. They even allowed the Sandhills congregation to cover the displayed crosses with a decorated sheet during services. Mindy Fineman, a member of the Sandhills Jewish Congregation, started an interfaith Thanksgiving service that brings together the Jewish community and several local churches each year. This interfaith cooperation continued into 2009, when the Sandhills Jewish Congregation met at the local Presbyterian church after a broken pipe caused substantial damage to their synagogue. In 2010, the congregation had 93 member households, consisting of about 150 adults. Most of the members are not native North Carolinians; many came from New York, New Jersey, Maryland, and Florida. While a majority of the adults are retirees, the congregation maintains an active lay-led religious school that had about 20 children in 2010. A handful of military families stationed at nearby Fort Bragg also belong to the congregation. Since retirees make up such a large percentage of the membership, the congregation is not growing significantly. Nevertheless, it seems clear that the Sandhills Jewish Congregation has established a permanent Jewish presence in Pinehurst.